Villa A touch of Dutch is a luxurious and spacious 4 bedroom villa in the new gated community Solterra. Our gorgeous brand new single story home in the beautiful Solterra Resort has a bright and airy open plan design with over 2100 sqft of living area excluding the gorgeous covered outdoor area (lanai). The house was professionally decorated with modern décor and contemporary furniture and its attention to detail will be the perfect accommodation for the more discerning clients. 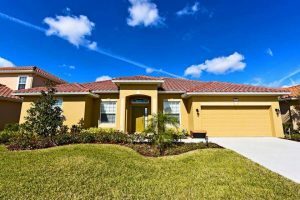 There is enough space for the entire family in this open, spacious, Disney area vacation villa paradise. The well maintained pool deck looks out on a conservation area and is Southwest facing. Hedges on both sides of the pooldeck give you a very private feeling and the extremely well-filled and air-conditioned games room (the dual racing game, an arcade machine, the pool table, foosball and airhockey table provide you with hours of joy) will make sure you never want to go home ! The location could not be any better. Only a few short minutes from Walt Disney World and Orlando’s other famous attractions like Universal Studios, Seaworld, and Legoland, our Solterra Resort villa rental sits nestled off Interstate 4 and Hwy 27. Easy access to shops, restaurants, and world class golf. The Living Room with its luxury large leather sofas and chairs will be the focal point of your stay, offering a large flat screen Television with DVD. It will be a great place to unwind and enjoy, films, sport or just relax after a day spent in one of the many parks that Florida has to offer. The Lounge is a lovely quiet area with seating and a table where you can enjoy a game of cards, read the newspapers or plan the next day’s events. The Kitchen is fully equipped with granite countertops and stainless steel appliances and can cater for all your needs. Breakfast and Lunch can be taken at the breakfast bar, or the cosy Breakfast nook which includes a table and Chairs. The Dining Area is beautiful and is for more formal gatherings where you can enjoy some home cooked delights while catching up on the day’s events. The Bedrooms, who all have a flat screen television, are luxurious and so comfortable that you will relish some private time spent there watching television or catching up on the latest novel; they are a little haven to retreat to before joining the other guests for your evenings together. The Master King Suite has a flat screen television and the Ensuite facilities of a bath and separate shower with a double sink. The Queen Suite has a flat screen television and Ensuite facilities of a bath with shower. Another Queen Bedroom and Mickey Mouse kids room (with 2 separate beds) share a bath with shower. The Outside of the home has a large private screened pool with a covered Lanai that has lovely corner cushioned seating with a coffee table. Just imagine the lovely sunny mornings where you can have a leisurely breakfast before setting out to the parks, or some nibbles and a cocktail on your return from a busy Orlando day, watching the children swimming, before heading out to one of the many excellent restaurants nearby. There are also sun loungers for you to spend some time in the warm Florida sunshine. THIS BEAUTIFUL HOME HAS ALL THE LUXURY AND GLAMOUR, THAT WILL LEAVE YOU FEELING TRULY PAMPERED. A washer, dryer and iron is provided in case you would have to do some laundry. And of course we offer free high speed WiFi throughout the house so you can stay in touch with the rest of the family or work if you must. The stunning Gated Community of Solterra is situated on the Ronald Reagan Parkway and is one of the most popular up-and-coming resorts in Florida, offering spectacular Resort Facilities including a 6,700 ft Clubhouse, poolside cabanas, swimming pool, lazy river, bar, spa, fitness center, business center with Internet, volleyball, tennis, children’s playground and picnic area.. It is a paradise located only 20 minutes from the area’s main attraction… Walt Disney World. This luxury gated resort sits nestled just outside of Orlando, Florida and has quickly become one of the most desired resorts in the Orlando area. Solterra Resort is only a 30-minute drive from the Orlando International Airport and is a great location for Disney and ideal for the golfing enthusiasts with 10 wonderful Golf Courses within a 3-mile radius, plus plenty of Shops, Bars, and Very Good Restaurants close by, plus it is less than 2 miles away from Posner Park which will be one of Florida’s largest and newest shopping malls. Central Florida’s renowned coastal region is only a short drive from Solterra! Within an hour you can be sunbathing in the Sunshine States fabulous Atlantic Coast and within only 50 miles you can enjoy the amazing waters of the Gulf Coast.